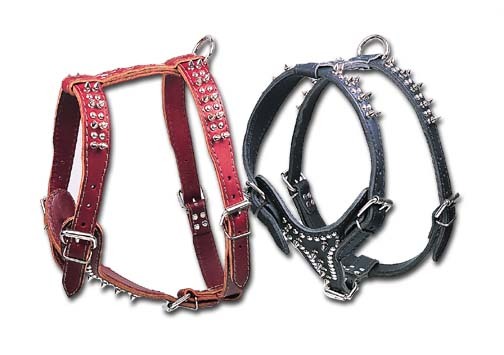 Heavy-duty 2-ply Latigo leather harness with studs and 1/2" spikes. Excellent hardware. #174DSK Medium: Chest Strap (A) Adjusts 28-34"
#174DSK Large: Chest Strap (A) Adjusts 31-37"
#174DSK X-Large: Chest Strap (A) Adjusts 38-45"